As you are well aware, I don’t blog like I used to. This is simply due to all of the work and writing I already do at PN. helpful, newly available resources that can benefit you. Mike Robertson has created an excellent new resource – Complete Single-Leg Training. Mike is a friend of mine, and one of the most sought after trainers and coaches in our industry. He’s trained professional athletes from virtually every major sport. He is also the co-owner of IFAST, an incredibly popular training facility that has been named one of the Top 10 Gyms in America by Men’s and Women’s Health magazine numerous times. So yeah – the guy knows what he’s doing! Do single-leg lifts really replace bilateral lifts like squats and deadlifts? How should I be coaching them for maximum effectiveness? What is the best way to progress someone to improve their single-leg training? Then you should check out Mike’s Complete Single-Leg Training. Ultimately, here’s the deal. Mike is a super smart dude. He’s always asking questions, always looking to learn, grow and improve. I’m not a salesman; I’m a dietitian, nutrition coach and strength and conditioning coach. And I found this product to be very helpful for my own training, as well as training my own clients. It gave me a system for using single-leg work, and if you know anything about me, you know that I find systems, processes, and concepts to be the KEYS to consistently helping folks, as well as myself. It makes it easy to know when to include single-leg work, what to include for whom, and when NOT to include it. This makes my job easier, clearer, more effective and more efficient. What coach doesn’t want that? So, check it out. See if it’s right for you. And let me know what you think. I’m excited to announce that I will be giving a full-day workshop at Cressey Sports Performance in Jupiter, FL on April 9th. I delivered a similar full-day workshop at CSP MA last April, and it was an awesome experience. This is the kind of nutrition coaching workshop I wish I had attended 10 years ago, when I was fresh out of my nutrition undergrad. It would have accelerated my knowledge, skills, and practical application 10 fold! I go through nutrition science, nutrition assessment and triage, making appropriate adjustments, as well as providing a coaching methodology to put it all into action. We then take all that theory and tackle some client case studies in groups, working through and applying everything we just learned. We discuss our process and next actions, debate their merits, and come out in the end feeling well prepared to provide nutrition coaching in the real world, with real people. Sign up now to grab the early bird discount for $20-30 dollars off! I’ll be doing a YouTube interview with Sam Feltham on Thursday, April 16th at 10am Eastern. If you have any questions you want me to answer, ask them right here. 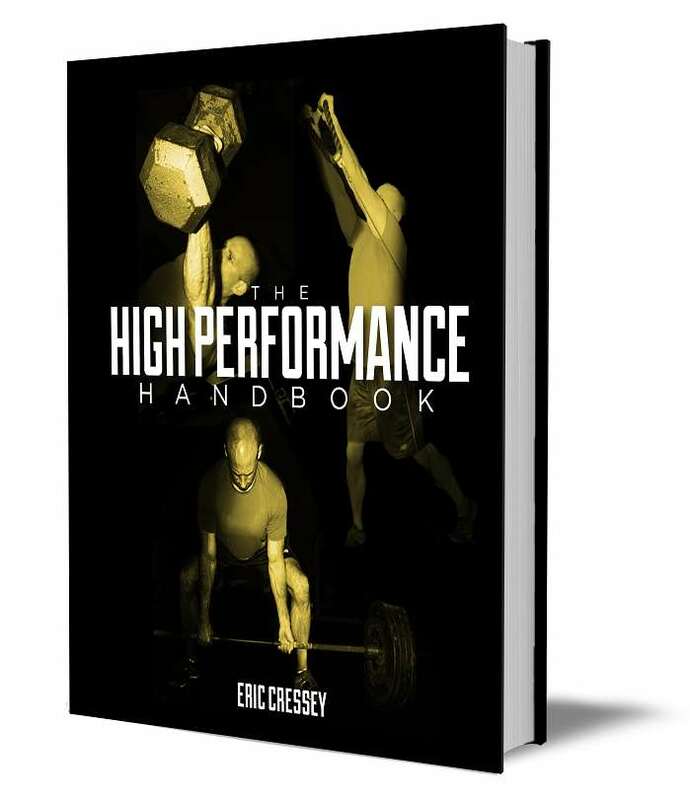 For the first time ever, Eric Cressey’s High Performance Handbook, his most popular product, is on sale. Through this Saturday at midnight, you can get this versatile exercising resource for $50 off the normal price. As the author of the accompanying High Performance Handbook Nutrition Guide, and having worked with Eric for 3 years, I have unique insight into the quality of his training programs. Quite frankly, they are among the best in the world. And are one of only a few that I would recommend. Eric went above and beyond to make sure that this resource covers all the bases. It’s not a one-size-fits-all cookie cutter program. Instead, it provides a quick and easy-to-apply – but incredibly effective – self-assessment component. This allows you to then go in a number of different ways with your training, depending on your goals, schedule, and assessment analysis. There’s even an entire chapter on modifying the program for special scenarios (over-40 lifters, overhead athletes, etc.). Eric covers it all. Additionally, there is an insanely detailed video database that covers how to perform every possible exercise in the resource. It features over 200 exercises, each with a 30-120s coaching tutorial. That’s over three hours of videos that will be a useful resource long after you’ve completed the program. As a final note, the High Performance Handbook also educates you along the way. You’ll learn about some of the things that are unique about your body, and how you need to manage your training accordingly. This will help you with your training for the rest of your life, not just the next 4+ months. I bought Eric’s handbook to help guide my personal training, and I think it’s excellent. I went for the extra option and took your nutrition guide as well. Just to say I think it’s the most sensible, practical, no BS nutrition guide I’ve read. I’m in the sports nutrition industry and so read a lot of stuff, including all the extreme/quirky/plain odd dietary “theory” stuff. If everyone chose your guide, they would save themselves a lot of time, money and disappointment. Just excellent Brian, thank you. Thanks again for all of your continued support. My Day In The Life posts are some of my most popular, and I get requested regularly to put up more of them. I will again emphasize that I don’t count calories or grams of anything. My intake tends to follow the PN hand-size portion guidelines, as you will see below. I hope you get something out of seeing a snapshot of my intake. And as usual, would love to hear your thoughts, questions, and comments! I just returned from providing some continuing education to high-level Equinox trainers in NYC. This is something that I do 4-6 times per year – providing 11 hours of continuing ed over the course of two days on each trip to major cities all over the US. And it always reminds me of the power of extended presentations like that. Having continuous access to a speaker/presenter for a couple of days allows for a more intimate and effective coaching setting. As the presenter, I get to be more comfortable, and really try to teach a big-picture perspective (because I now have the time). As as attendees, the trainers get to really absorb a lot of my thoughts and experiences, and ask innumerable questions over those 2 days. With that idea in mind, I wanted to introduce you to two world-class coaches…Joe Kenn (NFL Strength Coach) and Mike Robertson (who I have talked about many times). A few months ago, they put on an exclusive seminar called the Elite Athletic Development Seminar. Over the course of 2 days (15 hours) they pulled back the curtain to show exactly how they write programs and coach their athletes. And much like those private Equinox talks I give, that amount of time really allows for some unbelievable material to be shared, and to really see their big-picture approach to coaching. The seminar already happened so you can’t sign up for it now, but I wanted to let you know that they recorded that seminar and are making it available. A step-by-step process on how to build complex programs. Chasing one physical capacity is easy, but how do you address multiple factors without killing your athletes? If you’re serious about becoming the best coach possible, the Elite Athletic Development seminar is a must-have resource in your collection, so I highly recommend you check it out.